Is this the only product I need to be fully compliant? Our program is designed for the small to medium size facility and comes with everything needed to get and stay compliant. There may be special needs for certain types of facilities and your dedicated helper has expertise in HIPAA/HITECH and will be able to answer any questions you have as well as recommend solutions if needed. Do I need to get certified in HIPAA Compliance? This is a bit of a myth regarding HIPAA/HITECH certification. There is no official certification process that exists as a standard but some companies have created certification programs that offer training and upon completion offer a certificate but HHS does not recognize any as a standard yet. Can I change my subsription level up or down as needed? Yes you may at any time adjust your product level. Adjustments can be done inside the software and our highly secure recurring billing software will make the adjustment on the next billing cycle. We offer payment through our highly secure 128bit SSL Encrypted pay portal and Stripe to process payments. The monthly billing is auto-debited each month until you cancel. In an effort to keep our costs low, we do not offer manual monthly billing at this time. You may call at initiation and we will gladly process the payment manually and we will set up the auto debit feature at that time. We take all major credit cards. I see there's a monthly payment. Other programs don't have this. Why? We did a ton of research with this and determined by far the best and only way to stay compliant is by paying a monthly fee coupled with a cloud based solution. This is why we designed our entire platform this way. The problem we saw with competitors is they offer updates free for a set time then at the renewal charge a high fee for renewal. Some fees are higher than the original program, not to mention, most of these groups aren’t cloud based and won’t send updates when they get them due to higher costs to produce and ship. Maintaining a monthly fee combined with your cloud based dashboard guarantees you are getting the fastest updates possible. We simply update your dashboard which adjusts your compliance guage letting you know a task is needed. There’s no wait time and should you get a visit by an auditor, you can be sure you are 100% compliant. Are all the compliance forms I need, included? We supply all needed forms that are needed for compliance. Our program comes complete with several needed forms and we are constantly adding new forms every month. Need a form, just submit a support ticket and we’ll add one to the system. Have your own forms? Simply add them to your dashboard and edit accordignly using our editor. All forms can be fully customized with Logos and copy specific to your facility. Forms include Word Doc, Excel and PDF. Does the minimal priced solution have support? Our Basic package provides the same support that all our products have. Support can be in the form of trouble tickets, our moderated Forum and you can purchase support blocks of time in 1 hour increments. Support blocks are expert help and used when you have important privacy and security questions and need a compliance expert. Is there a way to monitor my Business Associates? 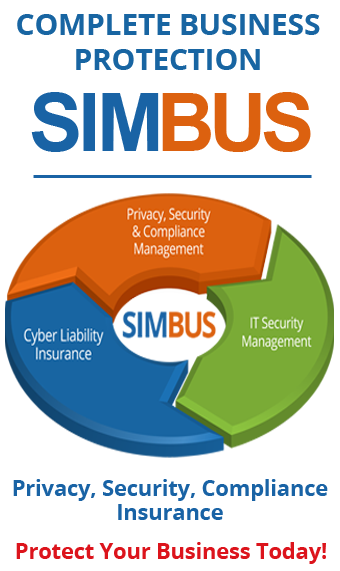 Certain levels of SIMBUS come with our Business Associate Tracking Software called SIMBUS Tracker. It is a full featured program that provides you with the ability to manage the relationship between you and your vendors. Simply add vendors one at a time or globally import up to 10,000 and automatically send vendors an invite to a private dashboard. Once inside, vendors take a 10 minute evaluation which will give a score of low, medium or high risk. The scores are sent to your dashboard giving you the option to require additional documentation if needed to maintain the relationship. Tracker comes with all needed forms, a dashboard with full graphical analysis and a search feature. Vendor panels come with a full file repository, breach management, file upload system and an intranet to make communication with the CE seamless. SIMBUS Tracker products have a limit to the amount of BAs you can manage but more vendors can be added through the system for an additional monthly fee. Does the compliance guage come with all program options? Yes, our handy compliance gauge comes with all levels of our program. This is a very useful visual representation of where you are in the compliance process. It’s also useful when we notify you of new law updates or forms we send to your panel. The goal is to always maintain 100% on all levels. Are there video instructions that assist in the program? We have training videos inside SIMBUS and we are adding more to specific sections every month. We built SIMBUS to be very intuitive and navigation around your dashboard is easy! You may cancel the service at any time and there are no long term contracts. You won’t be able to access your dashboard and helper should you decide to discontinue our service. We have less than a 2% cancel rate once the compliance process is completed. Are there any yearly charges besides the monthly fee? Simply maintain your monthly fee and there are no added fees. Ever!